Flammable materials are a necessary part of many industrial and manufacturing processes. While precautions ensure the containment of these materials, there is always some risk of ignition. Procedures for hot work and maintenance tasks lower the risk of heat and sparks from reaching flammable vapors. But, what about the electrical equipment we use every day? How do you make sure they don’t generate enough heat for a spark or ignition of flammable vapors? One answer is by using intrinsically safe equipment, as outlined by NFPA 70 (also known as the National Electrical Code), articles 500 to 506. OSHA also adopted these standards into 29 CFR 1910.399 for worker safety. In hazardous areas, one way of mitigating the hazards is by using intrinsically safe designs. Regulators define hazardous areas in classifications, divisions and zones. The division depends on the probability that they will contain flammable materials. This applies both in normal operations and abnormal events. Each category has its own requirements when it comes to what level of protection it needs. However, the basic principle of intrinsic safety is to lower the electrical and thermal energy of devices to the point where it is impossible for them to generate a spark. The process uses Zener diodes to limit voltage, resistors to limit current and fuses to shut off the electrical supply. There is a difference between intrinsically safe and explosion proof. Explosion-proof equipment does not limit the power output. Instead, it contains an explosion internally. Heavy-duty enclosures prevent the spread of ignition to flammable materials nearby. U.S. Chemical Storage manufactures intrinsically safe chemical storage buildings that comply with applicable standards. These buildings feature intrinsically safe, explosion-proof electrical components and accessories. Intrinsically safe equipment is UL listed, providing assurance that it meets the relevant codes. Only plug intrinsically safe equipment and cables into an intrinsically safe outlet. The low power rating of the outlet will not prevent a spark in the equipment if it is not designed as intrinsically safe also. Modifications to equipment may compromise its integrity. Drilling through explosion proof housing to mount it will create a path for sparks to leave the housing and cause an explosion. Don’t use a cell phone or any electrical device that could generate a spark in a hazardous area. Keep control over these items to ensure a safe working environment at all times. U.S. Chemical Storage has experts familiar with all aspects of hazardous and flammable storage, as well as intrinsic safety. We offer on-site training and site evaluations, to help identify hazards and take appropriate safety measures. 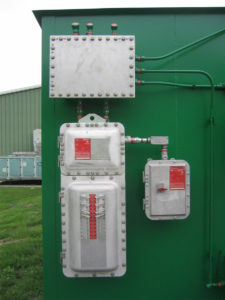 Our experts can advise on all details of your chemical storage needs to design a solution that is compliant and safe. Contact us today for a free quote.